The number one dental goal for most patients is the ability to attain a beautiful smile. Unfortunately though, plenty of patients feel like they’re unable to reach this goal because of the current state of their own teeth. This could be because of crooked teeth, discolored teeth, or even missing teeth. Even if you happen to have missing teeth, as your providers of affordable dentistry in Washington DC and Arlington, VA, we at Fidel Dental Group want you to know that we can help you restore your beautiful smile. One of the most effective ways we have of doing this is through our usage of dental implants. Dental implants are artificial tooth replacements that consist of small titanium posts that take the place of a missing tooth root. After the post is surgically implanted into the jawbone, it’s given time to heal for a few months. When this healing period is over, a custom-made, lifelike crown is attached to the post of the dental implant, giving the look, feel, and function of a natural tooth. Why Use Dental Implants for Your Missing Teeth? 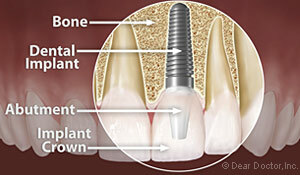 Dental implants look, feel, and function like natural teeth. They’ll preserve your underlying bone that naturally deteriorates when a tooth is lost. They don’t require any different care from the rest of your teeth. Dental implants have a success rate of over 95 percent – a percentage that’s much higher than other tooth replacement options. Implants are the longest-lasting and most durable of all tooth replacement options; with proper care, they can last a lifetime. Replace a Single Tooth – Often times, the best option for replacing a single lost tooth is a dental implant. This tooth replacement option has the highest success rate, making it the best long-term investment. This is because the implant will never decay to require any costly treatment, plus the tooth will look and feel just like a healthy natural tooth. 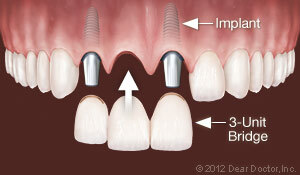 Replacing Several Teeth – If you’re missing several teeth, dental implants can provide the ideal replacement solution. 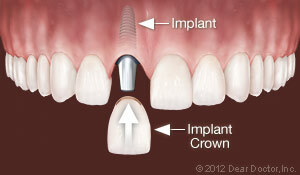 The great thing about dental implants is that you won’t necessarily need one implant for each missing tooth. 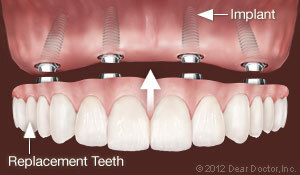 Instead, two dental implants can be used as supports for fixed bridgework that can cover multiple missing teeth. 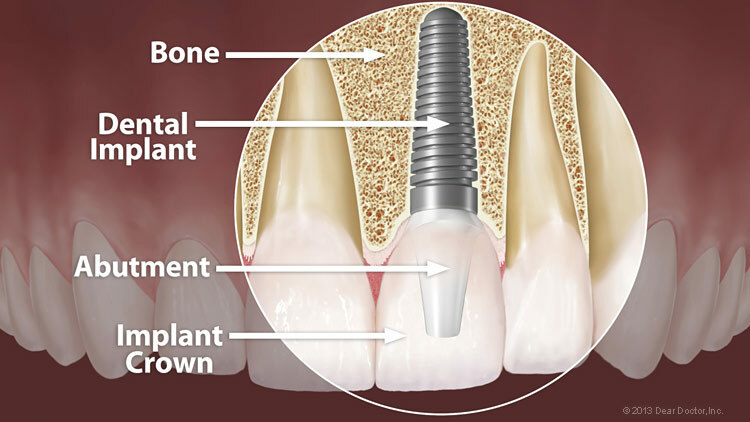 For example, if you’re missing three teeth in a row, an implant can be placed on each end of the missing space with a crown attached between the two implants to cover the remaining gap. This is beneficial because none of your natural teeth will need to be used as a bridge support – a task which can weaken your remaining teeth and make them more prone to decay. Replacing an Entire Arch – Implants can also be used to support an entire arch of teeth. 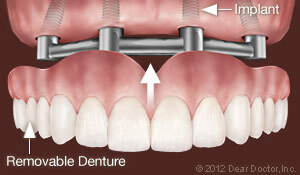 In some situations, as few as four dental implants may be needed to support this entire arch. With patients whose jawbone density and volume has deteriorated, five or six implants may be necessary to support a row of ten to 12 teeth. Supporting Removable Dentures – Implants can also make removable dentures more effective, comfortable, and healthier to wear. When replaceable dentures are normally worn, the dentures will rest on the gums, causing slippage and shrinkage of the jaws. When removable dentures are placed onto dental implants, that pressure is transferred into the bone structure instead of the bone surface, which will preserve the underlying bone and also prevent slippage when talking or eating. The only two ways a dental implant can loosen is by using an excessive biting force and through poor oral hygiene. This is why practicing excellent oral hygiene and refraining from grinding and clenching your teeth is critical. If you have a habit of grinding or clenching your teeth, we can fit you with a nightguard that will help protect your implants. Taking great care of your implants is simple as they only need the same regular brushing and flossing that your other teeth require. As providers of affordable dentistry in Washington DC and Arlington, VA, we’re glad to provide our in-house discount plan to our patients to guarantee that our treatments remain affordable and accessible. If you’d like to schedule an appointment with us, you can do so by filling out our online appointment request form or by giving us a call at one of our two convenient locations. Our Arlington, VA office phone number is (703) 575-9899 and our Washington DC office phone number is (202) 362-7413. We hope to see you soon!